Whether it’s your first ski holidays or whether you’re an intermediate skier or snowboarder looking to improve your skills and build confidence, it’s nice to choose a ski area that’s not too intimidating. While ski schools are invaluable for helping teach you technique and get you on your feet, sometimes the best way to practise skiing and snowboarding is by exploring the mountain on your own. In the following list we’ve highlighted some of the ski areas that have the most blue slopes, so you can ski your little heart out without accidentally coming up against any terrifying drop-offs. The Almenwelt Lofer is a small, romantic ski resort ideal for novice skiers and snowboarders or families with young children. 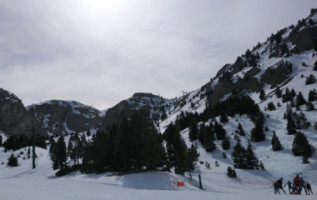 The ski area consists largely of blue pistes, with some more challenging red and black pistes for the more experienced. A friendly atmosphere reigns in the picturesque village of Lofer. Nestled at the end of the Ötztal valley, Obergurgl-Hochgurgl enjoys excellent snow conditions thanks to its north-facing slopes. 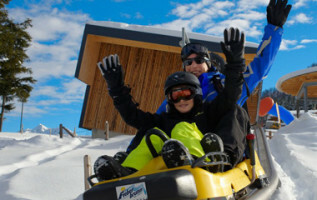 The two ski areas of Obergurgl and Hochgurgl are connected by gondola – intermediate skiers will be most interested in Hochgurgl, which has a high percentage of blue pistes. L'Espace Diamant ski area lies at the foot of the breathtaking Mont Blanc and boasts 192km of slopes for every level of skier and snowboarder. The ski area is ideal for mixed-ability groups, with a plethora of blue slopes but also plenty of green and black slopes. Many of the slopes lead right down into the valley, so that even beginners can avoid having to take the gondola down. Looking for a pleasant ski resort that focuses more on the après-ski scene and less on the intimidating black slopes? The Skicircus Saalbach Hinterglemm Leogang Fieberbrunn is the ideal ski area for you: out of 270km of pistes, 140km are blue. There’s even a ski circuit that has only blue pistes! The Saalbach Circuit is 20km long and can be skied by any intermediate skier. Despite its popularity with the jetset, the ski resort of Gstaad in Switzerland still has a quaint, charming vibe. Located in the heart of the Bernese Oberland, the village boasts beautiful views and excellent cuisine. As for the ski area, intermediate skiers will delight in the vast offering of wide blue slopes. The ski area at Obertauern boasts over 100km of pistes, most of which are blue. Since the village is surrounded by the ski area, much of the accommodation is ski-in, ski out. You’ll find no shortage of après-ski bars and fine dining here. Part of the Montafon ski area, Silvretta Montafon is one of the largest ski areas in Vorarlberg. 60km of the total 140km of ski slopes are blue, making this Austrian ski area the perfect choice for beginner and intermediate skiers looking to practise their turns. Le Grand Domaine is ideal for novice skiers, with about half the slopes being green and blue. Wide, well-groomed slopes pave the way for exploring the mountain in total confidence. This is a good choice for groups – even advanced skiers and snowboarders will be able to find a challenge amongst the 226km of slopes. This ski area in Italy has over 70km of blue slopes. Alta Badia is known for its imposing rock formations, perfectly groomed slopes and lively town with mouthwatering Italian cuisine. It’s also one of the four starting points for the well-known Sella Ronda ski circuit. Although they are not physically connected, the many smaller ski areas within the Tiroler Zugspitz Arena can all be skied with one ski pass, making this ski area an attractive choice for week-long ski holidays. You’ll find plenty of blue and red runs at Bichlbach, Ehrwald and Berwang in particular. This snow-sure ski area boasts no less than 180 days of skiing a year, making it a very popular choice with Brits. 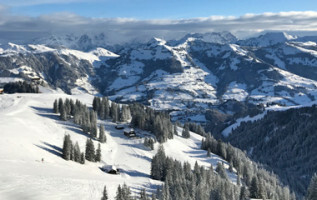 As the majority of the ski slopes at Kitzbühel & Kirchberg are blue, this ski area is a great option for beginner and intermediate skiers. There is an abundance of both blue and red slopes at Bardonecchia and they are often adjacent, the perfect set-up for intermediate skiers who are looking to progress. This unspoilt ski resort is only 90km from Turin, making it easily accessible for a weekend break. With 9 villages and nearly 300km of slopes, it’s not surprising that the SkiWelt Wilder Kaiser - Brixental is one of Austria’s most popular ski areas. The SkiWelt has something to offer every level of skier and snowboarder, including many red runs and more than 122km of blue runs. Born and raised in the ski paradise of Vancouver, Canada, I learned to ski before I can remember, balancing precariously on my parents’ skis as they sailed down the hill. I started snowboarding in my teens and am now delighted to be exploring everything Europe’s ski scene has to offer!